Bluid flowe diagram o the human hert. Blue components indicate de-oxygenatit bluid pathweys an reid components indicate oxygenated bluid pathweys. 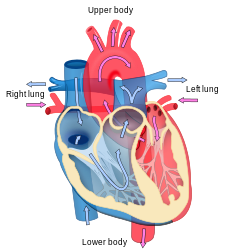 Cardiology (frae Greek καρδίᾱ kardiā, "hert" an -λογία -logia, "study") is a brainch o medicine dealin wi disorders o the hert as well as parts o the circulatory seestem. The field includes medical diagnosis an treatment o congenital hert defects, coronar airtery disease, hert failyie, valvular hert disease and electrophysiology. Pheesicians wha specialise in this field o medicine are cried cardiologists, a specialty o internal medicine. This page wis last eeditit on 22 November 2017, at 21:14.